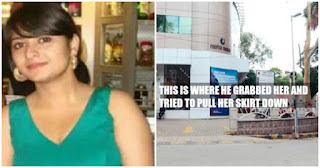 girl fighting with a drunk men with bravery and how she escaped with the situation, source via - google search, India news. Taking a stand against harassment, one 25-year-old senior executive for J W Marriott gathered her wits, chased, and nabbed a drunken pervert who felt her up in the middle of a bustling street on Tuesday night, She chased him on auto. Sen screamed and turned around to see the auto speeding away towards Lavelle Road. Wasting no time, the victim hailed another auto and told him to follow the first vehicle; they caught up with the first auto half a kilometer away, in front of Navnit Motors on Lavelle Road and forced them to stop. He then begged for mercy, As a huge crowd gathered around in support of the victim, Remi screamed at the pervert and called her colleague, who informed the Cubbon Park police. "I called my F&B director, Jolly, and told him what happened. He then called the police and all of them rushed to the spot to help. There was a strong stench of alcohol emanating from the pervert, and he began pleading for mercy claiming he hailed from a good family and was married with children, but I refused to listen," Sen told Mirror. "Apprehending the pervert and filing a complaint would send out a strong message." She then accompanied the police back to the station, where she lodged an FIR against the accused. Cops who found the pervert's driver's license identified him as Ajmal Ahamed A M, a former autorickshaw driver, whose vehicle had been seized due to irregularities a few months ago. "The police were very cooperative and encouraging of my actions. They said most victims of eve-teasing did not stand up for themselves, whereas apprehending the pervert and filing a complaint would send out a strong message. Police are also collecting CCTV footage from the camera installed at the exit gate of UB City as evidence, and the pervert was produced in front of a magistrate on Thursday and sent to prison," she added. A native of Kolkata, Sen has been a resident of Bengaluru for 10 years, and this is the first time such an incident has taken place with her. "If this can happen to someone just crossing the road home from their workplace on a busy street like Vittal Mallya Road, I shudder to imagine what could happen anywhere else. I'm grateful that the police reacted instantly," she said. High drama ensued on Bangalore's Vittal Mallya Road as Remi Rusha Sen was walking home from work around 8.45 pm. Moments after she crossed the road from the Marriott hotel to her apartment - about 150 meters away - an unidentified pervert sitting in the backseat of a passing auto rickshaw grabbed her backside and tried to pull her skirt down.